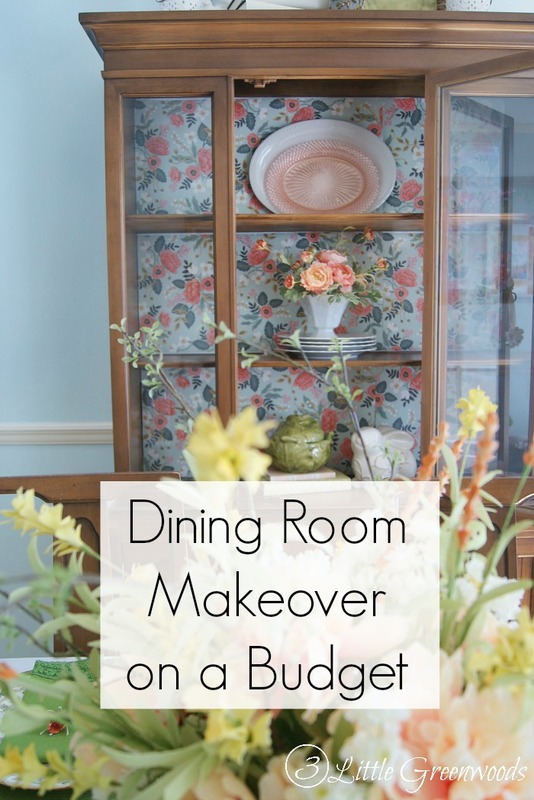 Then there was dining room makeover ideas on a budget – part one! There’s color. So much fabulous color! This post contains affiliate links for your shopping convenience. Click here for my complete disclosure policy. 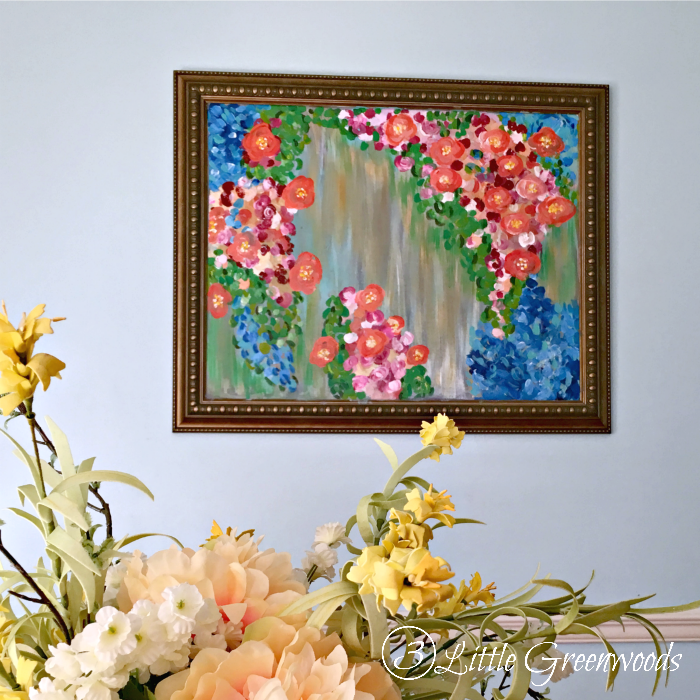 The first punch of color came from a $5.00 thrift store painting. It got a complete makeover and is so much prettier than the grey flowers of the before. 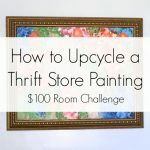 Come see all the details about how to upcycle a thrift store painting. 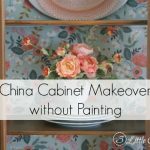 Next came a china cabinet makeover without painting. 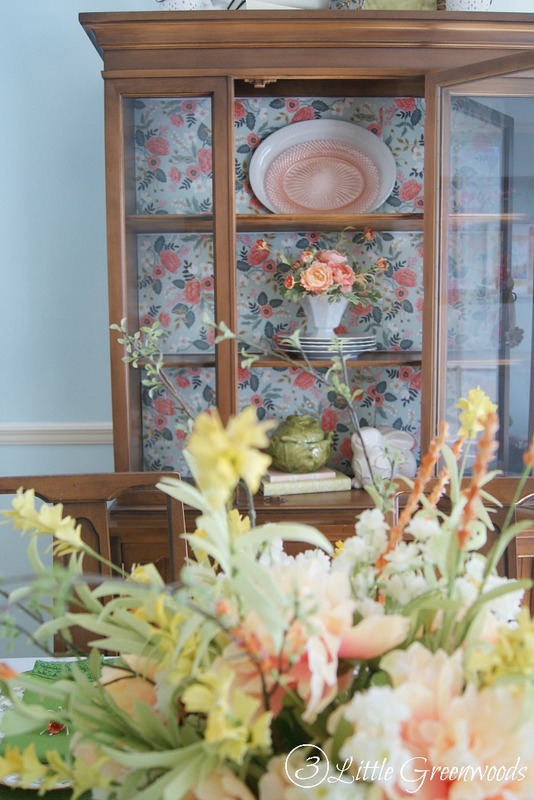 It was as simple as clearing out the china cabinet and added fabulous paper. Yes, the wrapping paper was a splurge but it was so worth it! A new printable was added beside another thrift store painting that was updated last summer. I used a fun paint-by-number painting technique to add bright coral colors on top of pink cabbage roses. 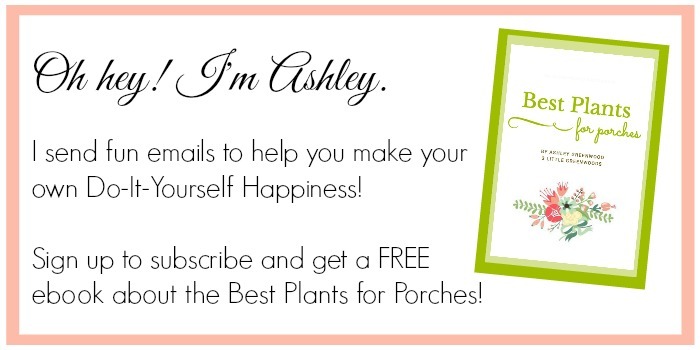 Come see the complete DIY paint by numbers technique! 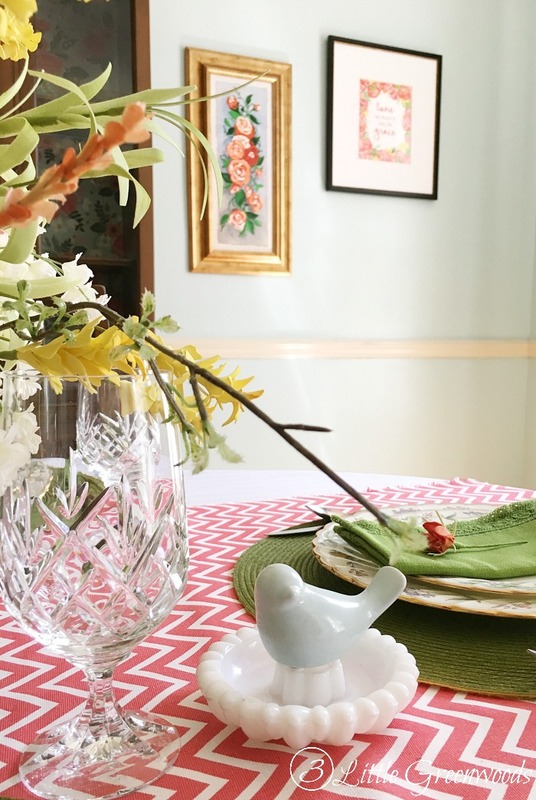 Finally, the table itself was all dressed up for Spring! 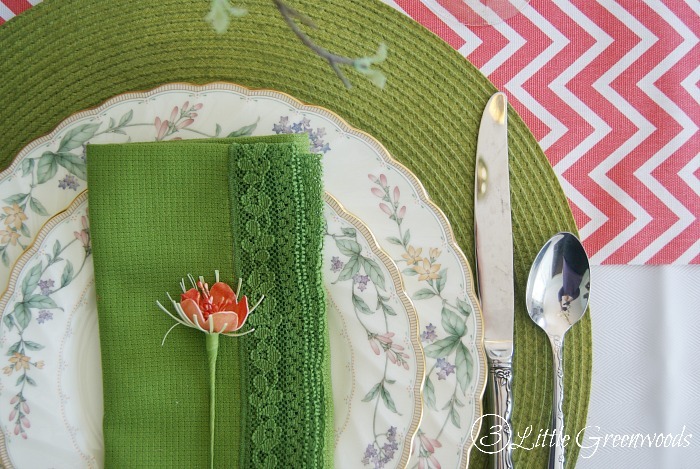 Our wedding china was paired with green napkins and woven placemats from the thrift store. 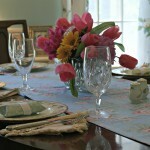 These versatile napkins and placemats have been used for Easter, Summer, Fall Entertaining, and Thanksgiving. 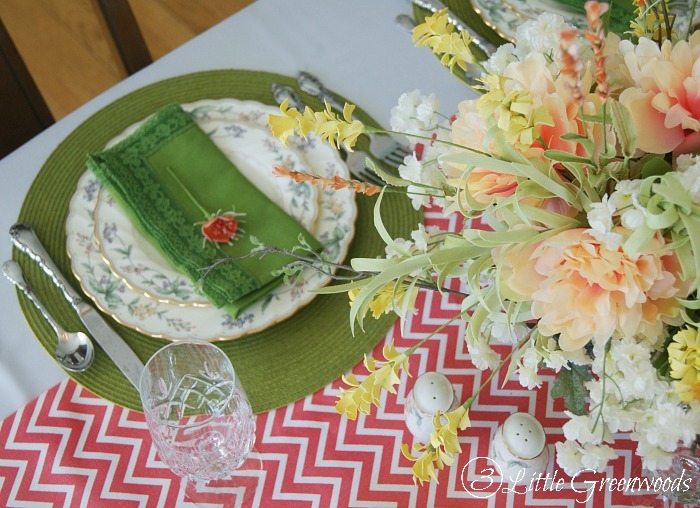 The new coral chevron table runner is simply three yards of fabric folded over and placed in the center of the table. It was a steal at $5.oo a yard. I’ll be able to use it for lots of other projects. 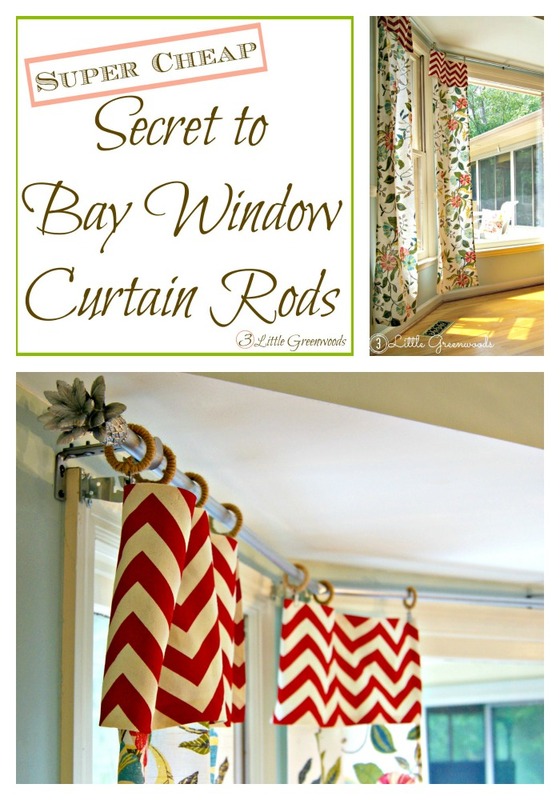 Go here to purchase this coral chevron fabric for your own home decor projects. 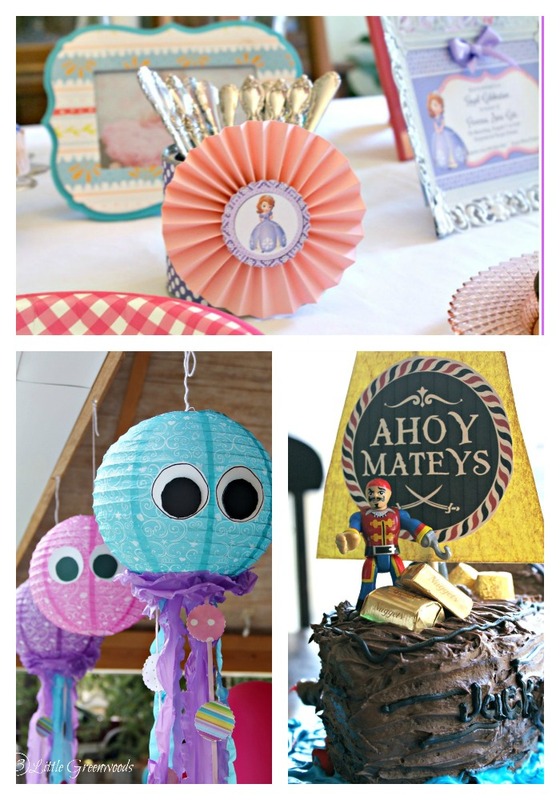 A few simple DIY projects were just what our Dining Room Makeover Ideas on a Budget needed! 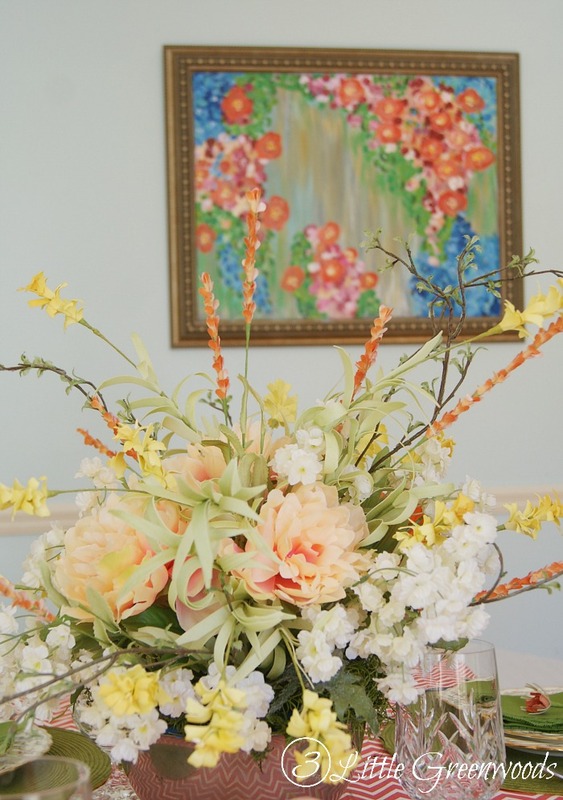 I hope you have enjoyed these tips for decorating a dining room on a budget and a coral and green tablescape idea. Whoa! 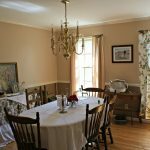 I’ve got $17 left in my $100 dining room makeover budget! Hmmm… I wonder what else I can find at the thrift store? 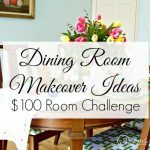 Let the $100 Room Challenge Reveals begin! 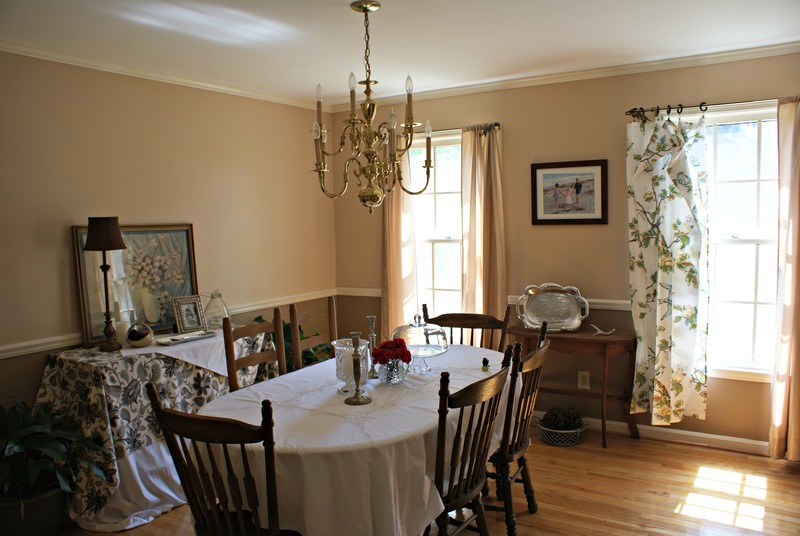 Love what you have done with your dining room, Ashley!! Beautiful! I just cannot get over that wrapping paper! 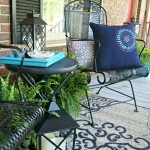 It just makes the space… and what a steal on the chevron fabric. Super cute. Thanks for joining the challenge. Enjoy your updated space! 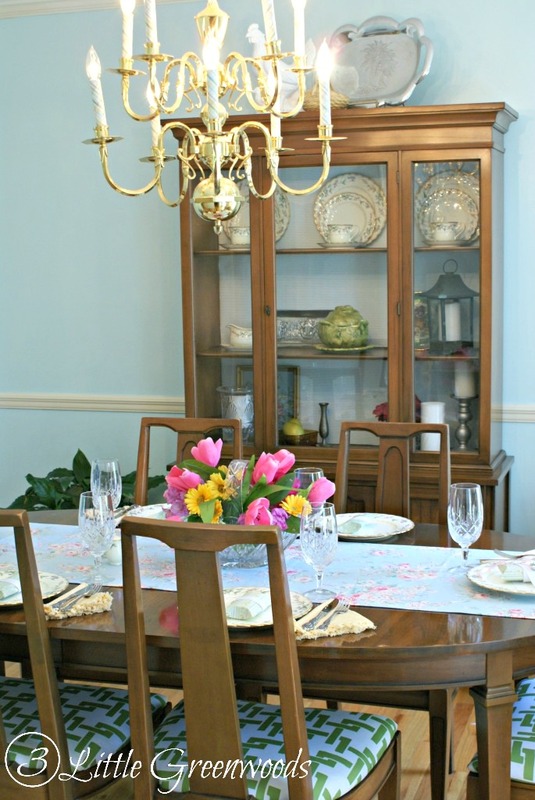 Your dinning room now looks happier! What a change! I love how it turned out! The hutch is beautiful!! Great job, I love what you did with your budget! My favourite element is that gorgeous wallpaper you used in your hutch!